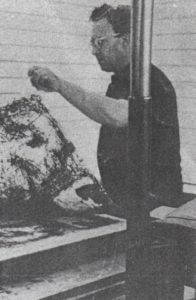 New York sculptor Reuben Kadish completed ten black and white lithographs during a fellowship grant at the Tamarind Workshop. The artist worked in close association with master-printer Bohuslav Horak to produce this impressive series of lithographs notable for their rhythmic vitality of line and the evocative properties of the imagery. Kadish’s Tamarind lithographs range in size from 15″ x 21″ to 25″ x 35″ and were printed on French handmade Rives BFK and Arches Cover and Japanese Nacre. The prints are priced at $50 each. All stones and zinc plates have been effaced in accordance with the Workshop policy of limiting all editions produced under its aegis. Until 1944, when he moved to the New York area from San Francisco, Reuben Kadish was recognized on the West Coast as one of the region’s foremost painters. During World War II he was a Life Magazine artist-correspondent in the India-China-Burma theater. Atheneum of Hartford, Connecticut, the University of Southern Illinois at Carbondale, and the Fine Arts Festival in Boston. Great Jones galleries. His one-man sculpture exhibition at the Poindexter Gallery in New York was heralded by critics as a major event by an American sculptor.